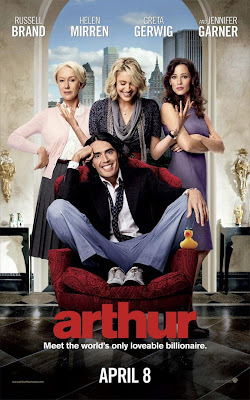 Two trailers for 'Arthur,' directed by Jason Winer and starring Russell Brand, Helen Mirren, Greta Gerwig, Luis Guzman, Nick Nolte and Jennifer Garner. In this fresh new look at a classic story, Russell Brand re-invents the role of loveable billionaire Arthur Bach, an irresponsible charmer who has always relied on two things to get by: his limitless fortune and the good sense of lifelong nanny Hobson (Helen Mirren) to keep him out of trouble. It opens 8th of April in the US and 22 of April for Ireland and the UK.